Looking for some last minute fall decor for your home? 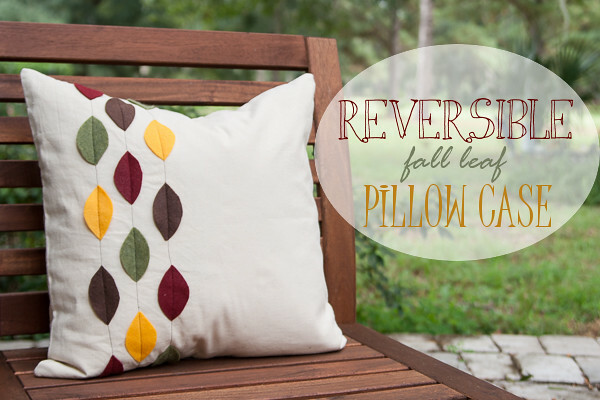 This reversible pillow was my entry for the Fall Decor challenge over at SYTYC and it won first place! It has a festive fall leaves design on the front and reverses to holly leaves do it can stick around through winter too! 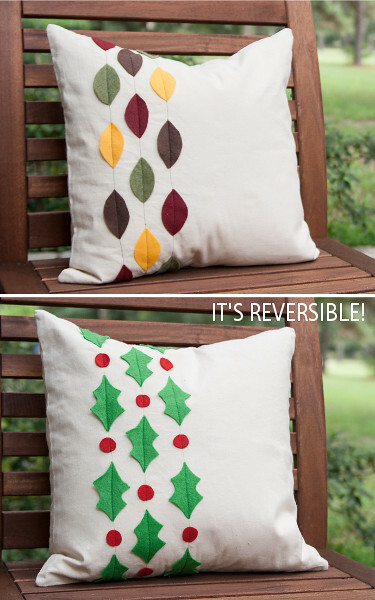 I have seen reversible pillows before, but they always have one design on the front and one on the back. I wanted this reversible pillow to have the second design hiding on the inside. That way if the pillow falls off my couch or somehow gets flipped over, I don’t end up with a Christmas pillow in September. 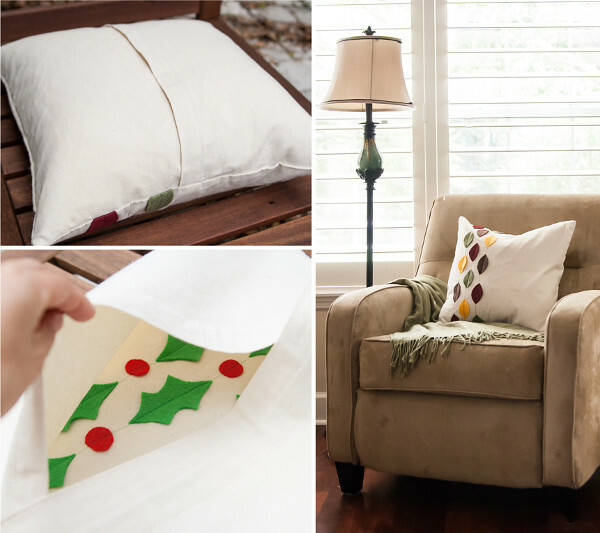 To make this pillow, I used an off white home décor fabric and some craft felt to make the leaves and holly. You can choose any fabric for the front; I recommend something with a bit of weight so it holds up better. 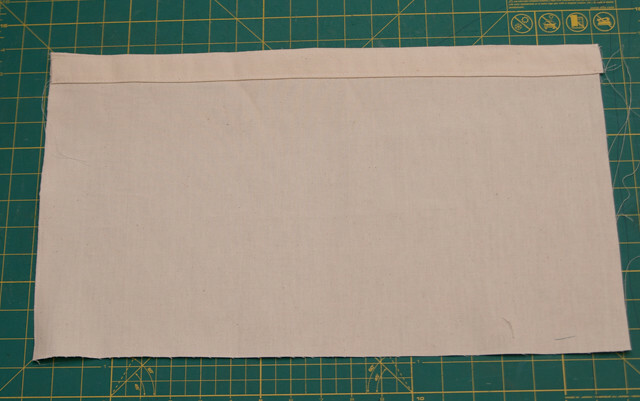 The envelope closure on the back is the same for both sides so if you choose two different fabrics for the front, make sure you choose something that coordinates with both for the back. The fabric for the back also needs to be one without a right or wrong side, meaning both sides of the fabrics look the same. Solid home décor fabrics are a good choice for the back. The first step is to determine the size your case needs to be. I had a pillow from Ikea for my insert, the tag says 20” x 20” but when I measured from seam to seam it was really more like 19”. 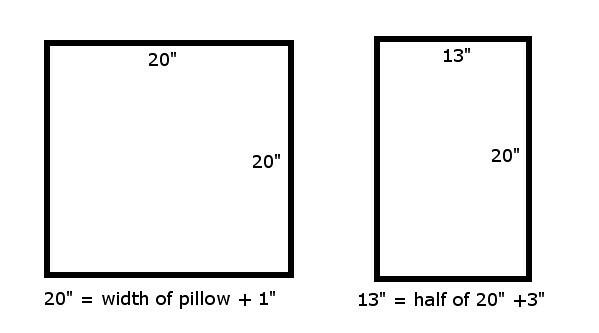 So I ended up making my case for a 19” x 19” pillow. 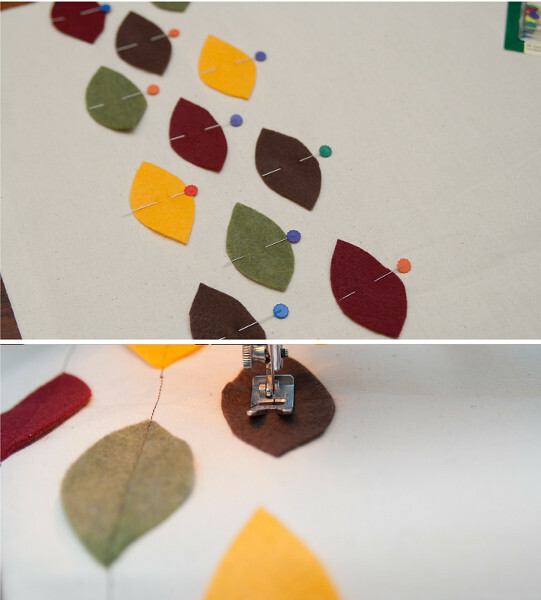 Cut your leaves from felt. I first sketched a leaf on paper to use as a template when cutting. My leaves are about 1.5” wide and 2.5” long. To cut the holly berries, I traced a nickel on a piece of paper you use as a template. 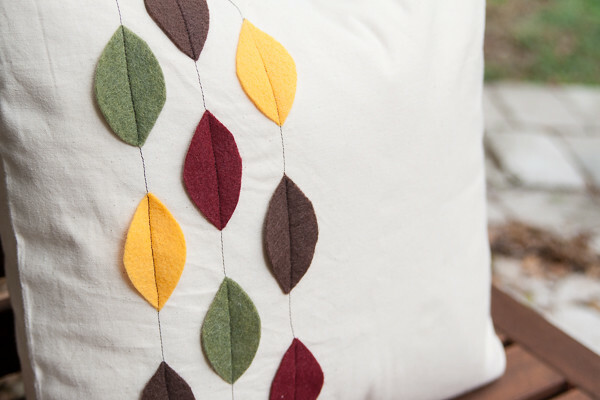 Pin your leaves in three rows on one of the pillow fronts, and then sew them on with a contrasting thread. Finish one long edge of the rectangle by folding the edge over ¼” and then another 1” and topstitching along the folded edge. 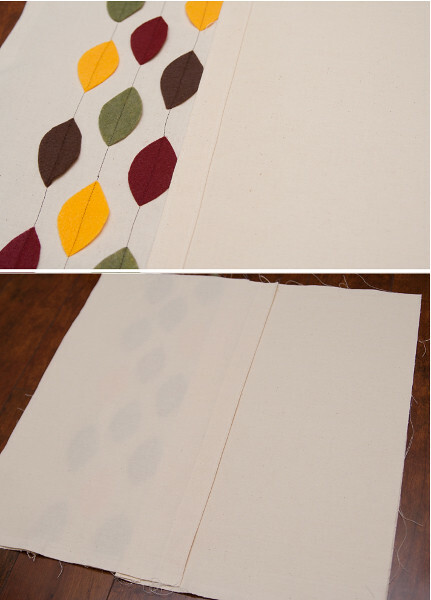 Lay your fall leaves front face up and place one of the rectangles on top with the folded edge up. Line up the three unfinished sides with the edge of the pillow front. Lay the other rectangle on the other side with the folded side down. Line up the raw edges with the edge of the pillow front, the finished edges of the rectangles will overlap in the middle. Pin around the edges and baste stitch all the way around the pillow ½” from the edge. Lay the Christmas side of the pillow case face down on top of the pillow backs. You should have the fall leaves on the bottom, the Christmas leaves on top, and the back pieces sandwiched in the middle. 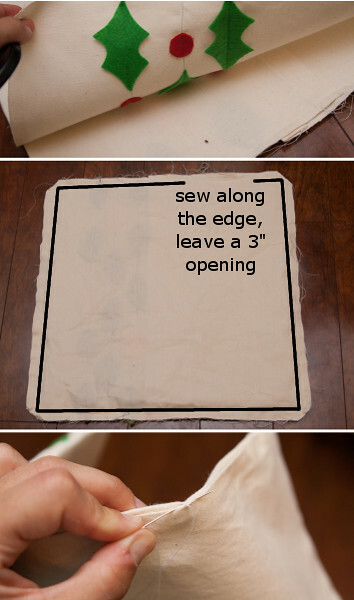 Pin around the edges and sew with ½” seam allowance leaving a 3” opening. Make sure the opening is not right where the leaves are. Clip the corners close to the seam to reduce the bulk. Turn the pillow through the hole you left open. Fold the raw edge in and hand stitch the opening closed. Wow, your pillow is so cute! I need it and I will try to do it! Thank you for such a lovely tutorial! Wow, the pillow is so nice. The post is not need for me, but it'll be great to my wife. Thanks! Cute pillows! This is exactly what I need. I'll do one. Thank you. Thanks for sharing these info with us! this is a great site. I really like it. Thank you for the site..You can also check out website that could be really beneficial to you. Enriching with complement pillows is dead basic and comes down to a couple of fundamental ideas. In this blog we will go over the four essential standards expected to include highlight pillows with elegance. I find a very good website for the best best pillow for side sleeper with neck and back pain. you can visit this site. When purchasing sheets, give some allowance for possible shrinkage after washing. silk full size bed sheets Hence, the price of such bedsheets are on the higher end of the pricing scale.